Lewis Hamilton secured his fifth Formula 1 world drivers' title as Max Verstappen won the Mexican Grand Prix in a near re-run of 2017's race. Hamilton came home fourth at the Autodromo Hermanos Rodriguez, but it was enough to pip Sebastian Vettel, who had to settle for second. Though any position in the top seven was suitable for Hamilton, he clearly wanted to see through his coronation in style and burned past the Red Bulls of Daniel Ricciardo and Verstappen off the line from third on the grid. However Hamilton's race soon turned sour – Verstappen passed him after the marathon run to turn one and he tumbled down the order as Mercedes' tyre choices were shown up. 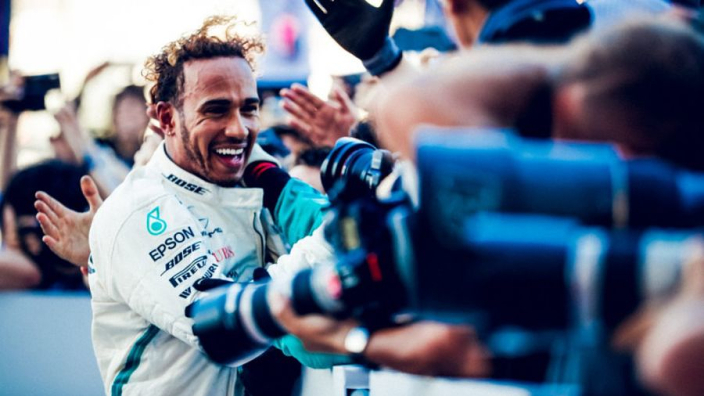 Hamilton spent much of the race berating his team over the radio, but his mood lifted as he crossed the finish line as it confirmed his standing as a five-time world champion – level with Juan Manuel Fangio and with just Michael Schumacher ahead of him. Max Verstappen wins the #MexicanGP. But LEWIS HAMILTON IS #F1 CHAMPION FOR A FIFTH TIME! Hamilton pulled into a special parking spot in the stadium section of the track - but only after executing some donuts to raise a cheer from the home crowd. Verstappen bolted clear after passing Hamilton on the opening lap and took a victory which might have soothed his pain at missing out on becoming F1's youngest pole-sitter the previous day. Although Mercedes celebrated Hamilton's win, they lost 11 points to Ferrari in the constructors' championship, who benefitted from Ricciardo's eighth DNF of 2018 to secure a double podium. After his pole-position glory of the day before, Ricciardo's car gave up on him with nine laps to go, which raised Verstappen's fears that he imght not take victory. However, Vettel dropped away to give the Dutchman his fifth grand prix win. Nico Hulkenberg, Charles Leclerc, Stoffel Vandoorne, Marcus Ericsson and Pierre Gasly also took points, while Sergio Perez retired from a likely scoring position to darken the home fans' mood.